As hospitals prepare for the new coding system’s arrival, sound testing strategies will be critical to success. Unprecedented. That’s how some industry professionals describe the impending impact of ICD-10 on healthcare organizations’ systems and processes. Like the implementation of any new large-scale project, testing will play a critical role in ensuring that the go-live has a minimal effect on patient care and revenue cycles. And it’s hardly going to be as easy as an open-book test, experts say. “Testing is going to be incredibly difficult,” says Stephen Stewart, MBA, FACHE, CPHIMS, CHCIO, SHIMSS, chief information officer for Henry County Health Center in Mount Pleasant, Iowa, adding that healthcare organizations should not expect that testing for ICD-10 will mirror that which would typically accompany other implementation initiatives. Industry professionals warn that the impact of the new coding system is expected to go much deeper than previous new-system deployment. Fletcher Lance, vice president and national healthcare practice leader for North Highland global consulting firm, points out that ICD-10 is expected to impact not only major hospital systems such as HIM, IT, and finance but also ancillary departments such as pharmacy, radiology, case management, and the laboratory. Specifically, Lance and North Highland have worked with clients to identify more than 50 applications and solutions impacted by ICD-10 and defined 13 remediation projects based on key points common among software products. They also have established an overall corporate IT response strategy, including timelines, resources, and work effort for each remediation project. 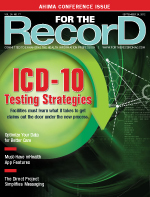 For those hospitals embracing the ICD-10 reality, Jarrell says most are forging ahead with a solid testing strategy. “They’ve come to the realization of just how invasive ICD-10 codes are to their environment,” he notes, suggesting that the testing process should be ongoing starting in October. Vendor and payer readiness are key components for making the puzzle pieces fit together during the testing phase. A 74-bed community-based health center, Henry County’s current payer mix is made up of 50% Medicare, 14% Iowa Medicaid, and about 25% Blue Cross Blue Shield of Iowa. With only three primary payers to consider, Stewart says the facility may be in a much better situation than some hospitals due to the fact that this group of payers appears to be more prepared for the ICD-10 transition than most. Functional testing refers to testing that ensures software components are working correctly. Data or input are fed into the program, and the output is examined. In the case of integrated testing, testing is completed to ensure that the combined parts of a software program function together correctly. As vendors begin sending updates for ICD-10, integrated testing will be a critical piece of the preparation process. With end-to-end testing, a complete software environment is measured against real-world use. Hospitals should be measuring their results and outcomes throughout the testing process, he adds, pointing to a “defect management process” that reveals trends over time. Another consideration is to establish an operational dashboard in relation to ICD-10 before the go-live to ensure controls are in place after the testing phase. Essentially, the testing process comes down to ensuring the efficacy of the applications and systems, documentation matches a patient’s care, and coding accurately reflects treatment. Stewart adds that the process also needs to ensure a hospital gets paid correctly according to its contract. Because payer requirements vary, rounds of testing will have to be conducted by payer class. Stewart notes that 20% of the ICD-10 codes often represent 80% of a healthcare organization’s volume. Since hospitals are not going to have the time or resources to test all 141,000 new codes, he suggests starting with a commonsense approach to identifying the codes that really impact the bottom line. He says looking at past claims or determining the highest chargemaster charges easily can accomplish this calculation. The rate of testing will essentially be driven by the number of updates coming from any given vendor, Jarrell notes, pointing out that most large organizations will have multiple software updates coming from multiple vendors. The frequency of testing also will depend largely on how a healthcare organization approaches its IT infrastructure: best of breed or a complete, integrated system. When an organization takes a best-of-breed approach, it purchases software from different vendors based on the best applications available on the market. Each of these applications is then integrated to create a complete system. Most hospitals lack the ability to identify a dedicated testing team, according to Jarrell. “It’s a real challenge for providers to dedicate the right resources. You want your best people involved in testing,” he says. Because of this challenge, Jarrell says it’s not uncommon for hospitals to enlist the services of a third-party testing center. Because testing will require codes to be entered twice—once for ICD-9 reimbursement and once for ICD-10 testing—the most obvious drain on resources will occur in HIM. “That’s going to tax coding resources considerably, and it’s going to cost us some overtime,” Stewart says. Jarrell agrees, adding that in the last three years, HIM professionals have become somewhat scarce, and it is only expected to get worse over the next year. Hospitals may feel competent about technology, but HIM resources will be limited both from an in-house and a third-party consulting standpoint. Stewart is concerned about when hospitals will be able to receive feedback from payers on how submissions will impact reimbursement. Some industry experts believe the detail provided by ICD-10 will enable a higher level of coding, equating to optimum reimbursement. However, others aren’t so sure that will be the case.